While hanging out before the Rebel, Rebel show. 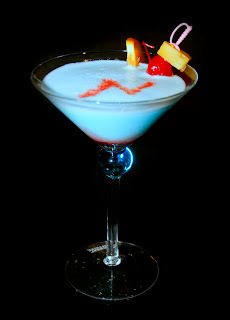 Someone mentioned we have a David Bowie inspired martini called a Moonage Daydream. I quickly stepped in to suggest something with Blue Curacao for color and Godiva White Chocolate to make it creamy. Originally, I thought of using Coconut Rum as the base, but after getting home and experimenting with the chemistry set, I decided the coconut flavor with chocolate was too much like the Obamatini. So I swapped it out for pineapple and the result was perfectly delicious and unique. Garnished with a small colorful fruit salad, I think the drink fits Bowie's persona just fine. Shake all ingredients except the Grenadine with ice in a shaker until it sweats and strain into a martini glass. Garnish with a small orange slice and a pineapple wedge with Maraschino cherry on a cocktail spear. Use a spoon or eye dropper to drizzle a lightning bolt shape with the Grenadine in the blue foam.